Revisited Myth # 58: Niches called ‘coffin corners’ were built into staircases to allow people to carry a casket downstairs and turn the corner. I must admit, this is one of my favorite myths. 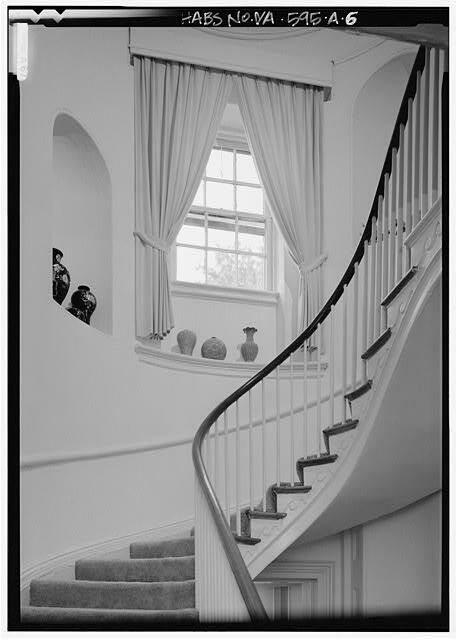 You’ll hear it in some Victorian-era houses that have architectural niches built into the wall of the staircase landing, as on the left above. The story goes that these niches were called coffin corners. Someone might explain that, because most people died at home in their beds and because most bedrooms were upstairs, it was difficult to get the casket up and down the stairs when the staircase turned a corner. So at the landing, Victorian architects would cut a niche into the wall. The pallbearers would insert one corner of the coffin into the niche and make the turn at the landing. Part of this is true: people did tend to die at home and the bedrooms of larger homes did tend to be located on the second or third floors. And many Victorian homes do have niches built into the wall of the staircase. But these were for decorative purposes: to display a statue, perhaps a bust, or a vase, or maybe flowers. Why would anyone carry a coffin upstairs to the corpse rather than carry the corpse downstairs to the coffin? Most books about Victorian architecture debunk this myth. For example, John Maass calls it a hoax in The Victorian Home in America (1972). This entry was posted on Sunday, September 20th, 2015 at 6:55 am and is filed under Architectural Features. You can follow any responses to this entry through the RSS 2.0 feed. You can leave a response, or trackback from your own site. 7 Responses to Revisited Myth # 58: Niches called ‘coffin corners’ were built into staircases to allow people to carry a casket downstairs and turn the corner. Awesome post! I have heard of the myth and thank you for debunking it. Although, it was a logical idea, wasn’t it? I don’t doubt that this is a myth. However your question about carrying a coffin upstairs is doubtful as well. Dead bodies are very difficult to move, but placing the body in a coffin allows the body to be easily transported as there are handles to carry it. What about space, but not as grand as a niche, in servants stairs, to get their coffins out? Seems like I’ve seen this in movies where it was shot in a real home and not a set? There may have been space in a servants’ stair, but it wouldn’t have been for a coffin. There is just no reason to lug a coffin up/downstairs when you can simply carry the corpse and place it in the coffin downstairs. Do you think there has ever been a time or place when there was such a thing though? Thackeray describes a staircase coffin niche for this very purpose in ‘Vanity Fair’, published in 1848 and set in 1815 Georgian London, which seems a pretty good source … is it possible that the myth started as far back as that? Sure, it’s possible (that the myth started with Vanity Fair). But no, I don’t believe there was ever a time in the 19th century (when these niches proliferated) when they were built with coffins in mind. These were decorative niches. Could someone have used the niche to angle a heavy table or cupboard up the stairs? Maybe. Unlikely that anyone would carry a heavy wooden coffin up- and downstairs unnecessarily, however.